AboutBail.com, a trusted network of bail agents, recently launched a redesigned website with new features. One of those new features is a category listing for private investigators who are members of the PInow.com network. As one of the trusted legal support networks under the umbrella of Lawgical, AboutBail is considered a sister site to PInow.com and ServeNow.com, a network or prescreened process servers. Private investigators who are members of the PInow.com network are also listed on AboutBail.com at no additional charge. As one of the most trafficked websites in the bail industry, listings on AboutBail.com provide additional exposure to private individuals, bail agents and criminal attorneys who use the site. For investigators who provide skip tracing, fugitive recovery and people locate services, this additional listing is especially benefitial, and amounts to a new marketing tactic at no extra cost. Where can I find my listing? From the home page of AboutBail, under What is the AboutBail Network, private investigators are listed as an additional service provider along with criminal attorneys and immigration bonds. 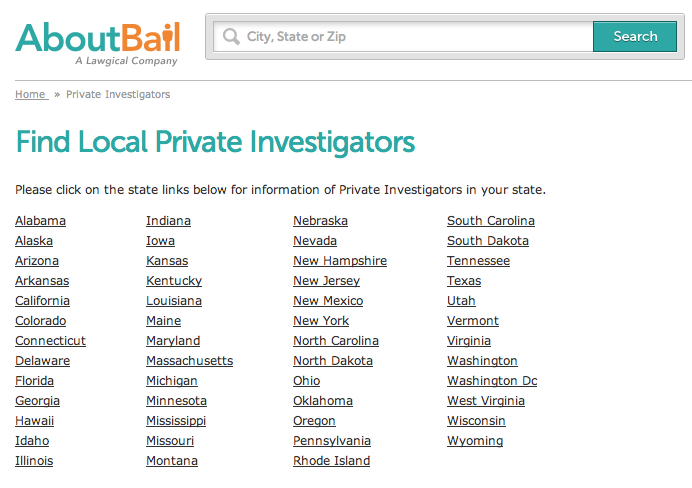 The private investigator link takes you to the Find Local Private Investigators page of AboutBail, where you can select your state. All private investigators are listed by state. In each results page, investigators are listed alphabetically by city. As you can see, the listing showcases your company name, location and phone number. The business information displayed on AboutBail is the same profile information you have submitted to your PInow profile. Clicking on the business name will take you to your PInow.com profile. 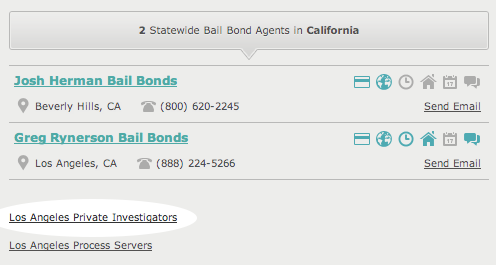 In addition, private investigator links are always at the end of bail bond search results. 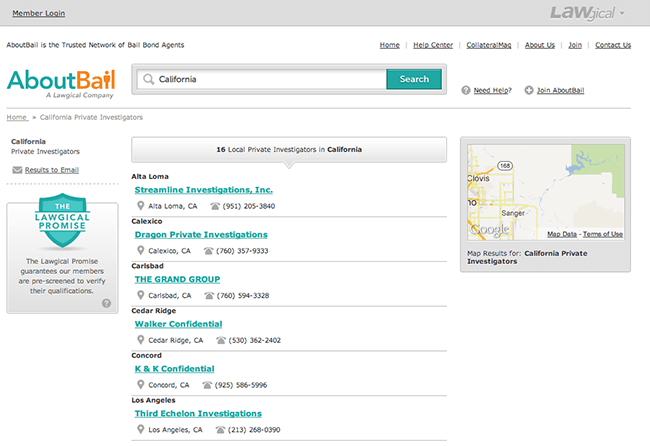 For example, if you operate an investigation firm in Los Angeles, any time an individual searches for a bail agent on AboutBail.com they will have access to a link leading to Los Angeles Private Investigators search results on PInow.com.